" The last 3 images are supposedly of the Oregon Trail near Guernsey, WY. 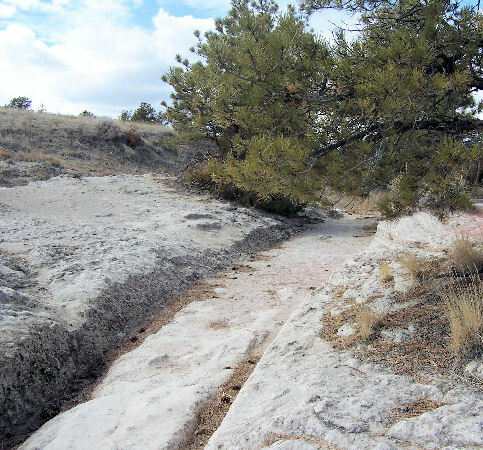 I am very skeptical of this as the Smithsonian Magazine describes these ruts as 5' deep in soft sandstone. " Malta trail are deeper because they may have been used more intensively (obvious in the case of constant quarry work) and for much longer time than the Oregon trail, which have been in full intensive use for about twenty years, from the 1849 California gold rush until the train was completed in 1869 (my opinion). The Oregon Trail was laid by fur traders and traders from about 1811 to 1840, and was only passable on foot or by horseback. By 1836, when the first migrant wagon train was organized in Independence, Missouri, a wagon trail had been cleared to Fort Hall, Idaho. Wagon trails were cleared increasingly farther west, and eventually reached all the way to the Willamette Valley in Oregon, at which point what came to be called the Oregon Trail was complete, even as almost annual improvements were made in the form of bridges, cutoffs, ferries, and roads, which made the trip faster and safer. From various starting points in Iowa, Missouri, or Nebraska Territory, the routes converged along the lower Platte River Valley near Fort Kearny, Nebraska Territory and led to rich farmlands west of the Rocky Mountains. From the early to mid-1830s (and particularly through the epoch years, 1846–69) the Oregon Trail and its many offshoots were used by about 400,000 settlers, farmers, miners, ranchers, and business owners and their families. The eastern half of the trail was also used by travelers on the California Trail (from 1843), Mormon Trail (from 1847), and Bozeman Trail (from 1863), before turning off to their separate destinations. Use of the trail declined as the first transcontinental railroad was completed in 1869, making the trip west substantially faster, cheaper, and safer. 400 000 passages is a lot, but it came quickly to an end. Was it the case in Malta? We just don't know.